From the moment The Kid awakens he's vocally followed by an aloof narrator. That, above all else, makes Bastion stand apart from a stagnant game market. The narrator's ever-present dulcet tones hounded and haunted me as I played but they simultaneously drove me onward. Super Giant Games has implemented a storytelling device in a unique way that must be experienced to be appreciated fully. I should have written about Bastion when it first released on XBLA but I was far too busy playing the game. I beat my first playthrough of Bastion within three days of it's release. I honestly can't tell you the last time I was so drawn into a game. Mechanically, Bastion is a hack and slash, but putting it like that doesn't do it justice. Every weapon has it's own individual feel, something often overlooked and no easy feat to accomplish. Choosing and customizing the weapons that accompanied me were fun decisions because they actually mattered. The bow ended up being my trusty companion during my adventure while I switched out the second slot to play around with all the other weapon options. I'm four paragraphs in and haven't even mentioned the visuals. Shame on me. The way the world is reconstructed at The Kid's feet is simply breathtaking. It gives the world the feeling of being utterly destroyed with just a tiny bit of land still clinging to existence. The artwork throughout is beautiful and made every new area a treat to explore. 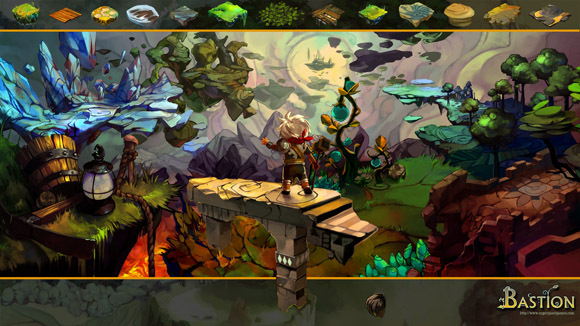 At this point it would be next to impossible to top Bastion as my favorite indie game of the year. We'll see how I feel in January, but this game completely captivated me. It's out now on PC and XBLA for just under $15.